VietNamNet Bridge – The Center for Research and Preservation of Vietnamese Culture and Belief and chau van artisans in northern and central provinces have joined hands to establish a club to preserve chau van art. This is the first club of its type in Vietnam. The club’s members are professional chau van singers, folk music instrumentalists, researchers, cultural managers, deity worshippers and chau van fans. The club’s goal is to preserve and develop artistic values of the chau van art as Vietnam’s intangible cultural heritage. Chau van senior artists who are the club’s founders will teach ancient chau van songs to young club members. The club plans to ask the Vietnam Folk Art Association to recognize five senior chau van artists as Folk Artisans of Vietnam. 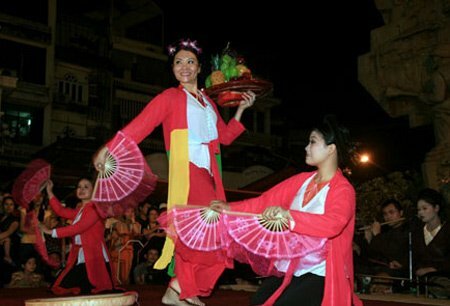 Chau van is a traditional Vietnamese folk art which combines trance singing and dancing. Its music and poetry are combined with a variety of instruments, rhythms, pauses, and tempos. Chau van originated in the 16th century and spread quickly. The main musical instrument used in hat van performance is the dan nguyet or moon-shaped lute. The genre is famous for its use in rituals for deity mediumship. Chau van serves two purposes: to help hypnotize the medium for reception of the deities and to accompany the medium's actions with appropriate music.